It is significant, I have been told by an iconographer and my spiritual father, that the icon of the crucifixion is mysteriously/paradoxically peaceful in its portrayal of the event unlike many of the Western artistic portrayals. I remember Fr Ioannis pointing this difference out as he led a group of us through the painted churches of the Troodos Mtns in Cyprus. The ‘Byzantine’/early Christian image is of Christ standing triumphant, calling to the mind the triumph of the cross and our Lord as the Victor. This motif was prominent in western Christian art until the later Romanesque and Gothic periods, when it was replaced by an image of the suffering Christ. 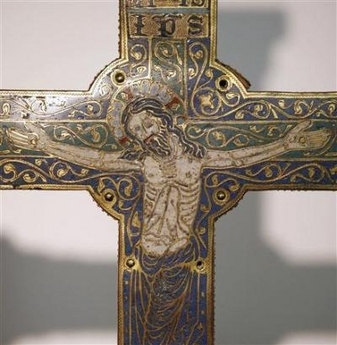 Andrew Graham-Dixon says that this occurs in the late 13th century in Italy, after the Franciscan revolution where Christ as the suffering Servant is emphasised a bit more — thus Cimabue’s crucifix from c. 1265. In the Later Middle Ages, this accompanied a form of piety in the West where the devout would think upon the wounds and suffering of Christ, often aided by such images. I think this is a case where we often present a false East-West dichotomy, for there are Byzantine mosaics, as in Hosios Loukas (11th-12th-c), that show a limp, dead Christ on the Cross, as well as a continuing interest in Christus Victor crucifixes in the West alongside the more naturalistic interpretation of the High and Late Middle Ages. I believe we need both in Christian art. We need to see that Christ on the Cross is the King of Glory, that he is triumphant, that his death is God’s victory over sin. But we also need to be reminded of the scale of the cost of our salvation, that God, as the person of Jesus Christ, actually and truly suffered and died. Our art, as our theology, should have acquaintance with both sides of this tension. That is a striking passage, and makes me want to get on with reading the whole book, which I left off…..um, too long ago to admit.